Nestled 8 kilometers southeast of Danang City, Ngu Hanh Son looks like five fingers rising out the ground. It was named after the five basic elements of the universe in which each mountain is assigned an element – metal, wood, fire, water and earth. This is a cluster of five marble mountains lying close to the sea so it also is dubbed Hon Non Nuoc, which means mountain and water in Vietnamese. The limestone mountain is home to splendid scenery, pagodas and grottoes, seducing travelers by the tranquil air and natural beauty. I came to the area with a friend by motorbike and actually realized although they are called mountains they are only about 200 meters about sea level but no matter the height this is still undoubtedly a bewitching and inspiring place. Parking at the foot of the small mountains we bought tickets priced at just VND15,000 each and started the excursion. Following a local’s suggestion, we trekked up to Thuy Son Mountain which is the highest and the most beautiful peak in the range. Thuy Son, covering an area of about 15 hectares, has three peaks of Thuong Thai, Trung Thai and Ha Thai. 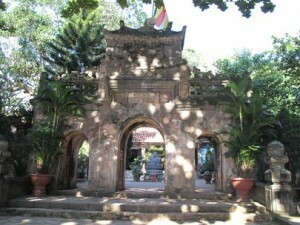 Tam Thai Pagoda was the first stop after conquering hundreds of stone steps. Unlike previous mountain treks, this was not so grueling which was a nice change. Instead of being tired I was just a little bit thirsty. After exploring old architecture and burning some incense at the pagoda, we were keen to chase down grottoes to sense the chill inside the stone, to find out the sixth sense in the darkness as well as to admire stalactites. I was really crazy for the fresh air, the tranquillity, the amazing panoramic view to the town below and pristine Non Nuoc Beach. Descending on foot, we strolled around a traditional stone-engraving village. All along the area sculptors ply their trade in small gardens, which double as workshops and outdoor showrooms. You will find traditional and modern motifs and imagery with diverse products from statues, jewelry, household items and artworks. I was attracted with the demonstrations of craftsmen and I realized that it is not easy to make a stone art piece. It requires artisans with skills, dexterity, patience, a hardworking ethic and good health. I totally got lost in the world of stone and I found that stones also have a soul. I left the village and the noise of hammers and saws behind. In my mind I was still thinking of images of gentle and friendly artisans as well as austere-faced women. I felt that life is a bit harsh there for women who have as much passion and professional working spirit as men. Tourists just relax and enjoy seeing new things but it is not real to them. What I experienced makes me feel grateful for my life, my job and my family and friends.